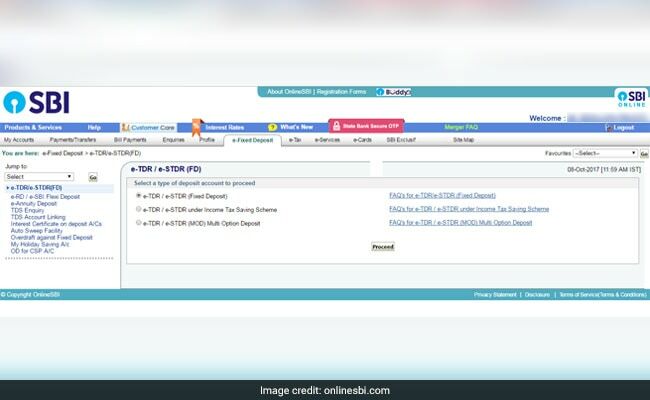 SBI changed its fixed deposit or FD rate, with effect from November 1. State Bank of India (SBI), India's biggest lender, has cut interest rates on fixed deposits or FDs with effect from November 1, 2017 for deposits below Rs 1 crore. SBI has cut bank FD rates by 25 basis points. After the recent revision, SBI fixed deposits of one-year maturity will now fetch 6.25 per cent interest while senior citizens will get 6.75 per cent interest rate. 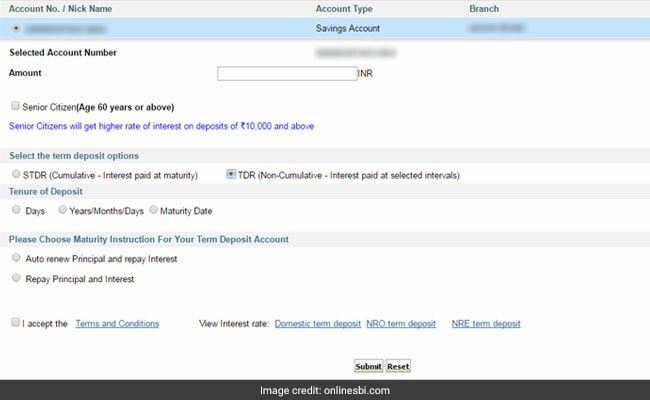 State Bank of India (SBI) offers an easy option to its savings bank account holders to open fixed deposit/term deposits online. Using SBI's online banking platform, SBI account holders can open e-fixed deposits sitting at the convenience of their home and save time. Also, SBI account holders can pre-maturely close an fixed deposit online using its net-banking platform. SBI revised interest rates on retail domestic term deposits (below Rs 1 crore) with effect from November 1, 2017, according to its website. 1) Login to your SBI online banking facility using your login id and password. 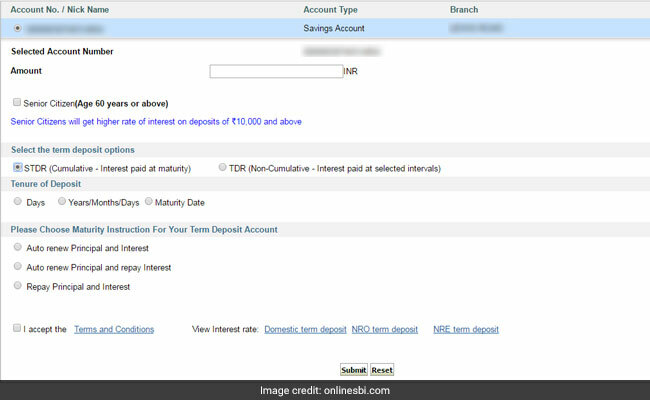 2) On the home page, select e-fixed deposit tab on the top menu. 3) Once you select the e-fixed deposit, you will see three options i.e. fixed deposits, fixed deposits under income tax savings scheme and multi option deposits. If you want to open normal fixed deposit, then select the first option and click on "proceed" button. 4) If you have multiple bank account numbers linked to your online banking, select the account from which you want the FD amount to be debited. Then fill the amount for which you want to create an FD. If you are a senior citizen, then select the "senior citizen" option. Senior citizens get higher interest on some maturities compared to others. 5) Below the "senior citizen" option, select the term deposit option. If you want your quarterly interest to be reinvested and paid along with principal at the time of maturity, then select "STDR" option. If you want your interest to be paid quarterly, then select "TDR" option. 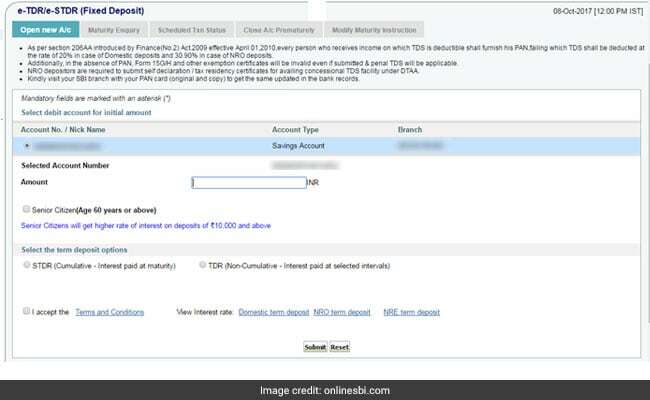 6) Once you click on the "STDR" option, it will ask you to fill the tenure of deposit. If you want to fix the maturity of your FD in number of days, then select "days". If you have a fixed date in your mind for your FD to mature, then select the "maturity date option", otherwise select the "years/months/days" option where you can give the maturity in no of years plus months and days like four year, two months and 15 days. 7) After you select the tenure, you have to select your maturity options from three available options - auto renew principal and interest, auto renew principal and repay interest, repay principal and interest. 8) If you select any of the first two maturity options - auto renew principal and interest , auto renew principal and repay interest - then you will also have to give the tenure for which you want your FD to be renewed after maturity. 9) Now read the terms and conditions and accept them to create the e-fixed deposit. 10) Once you accept and click "submit", your fixed deposit will be created and you will get a confirmation for the same. Please record the transaction number for any future reference.